Football is a big deal in our house. My husband is a die hard Steelers fan (which is hard when you live in Ravens country! ), but he also enjoys college games as well. Needless to say, from September to February, there is a football game on at our house almost every night. On the weekends, we sometimes like to make what we call football snacks, which is basically a snacky dinner that we can eat while watching our team play. Sometimes it’s as simple as chips and dip; other times, I make fancier foods like loaded nachos or chicken wings. 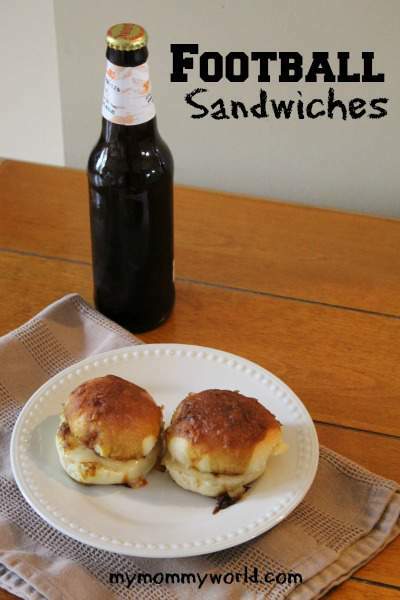 Recently, however, I found a recipe for Football Sandwiches that are to die for! Basically ham and cheese sandwiches baked with a savory sauce on top, they are super easy to make and taste delicious. 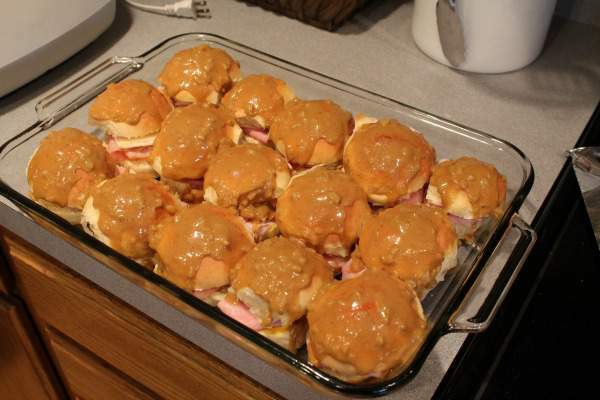 I first made these for a church potluck, where they were all gobbled up in no time. My husband likes them so much that he has requested them 3 or 4 times since the church event, and I’m always happy to oblige! To begin, slice 12 to 15 store-bought or homemade rolls in half and lay in a 9-inch by 13-inch dish, which has been sprayed with non-stick cooking spray. Take the tops of the rolls off and slather each side with plain yellow mustard. Layer in one slice of deli ham and one slice of swiss cheese, then replace the tops of the rolls. For the sauce, simply add minced onion, Worchestershire sauce and garlic powder to melted butter, then pour evenly over sandwiches. Pop them into a warm oven for about 20 minutes and you’ll have a very tasty football snack on your hands! Preheat oven to 350 degrees. Slice rolls and lay the bottom halves in a 9-inch by 13-inch baking dish, which has been sprayed with non-stick cooking spray. 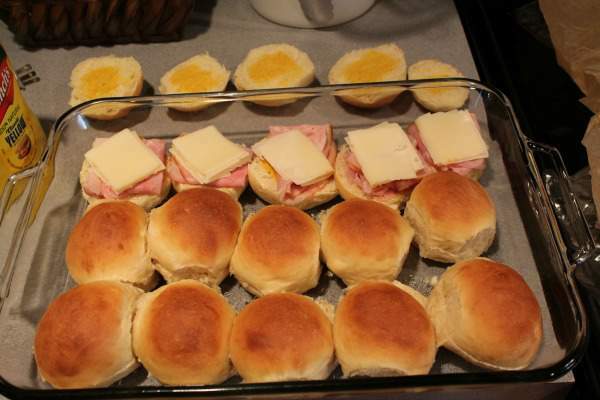 Slather each side of the rolls with the mustard, them layer a piece of ham and cheese on each bottom half. Cover with the tops. Microwave butter and onion together in a microwave-safe bowl for 1-2 minutes, then add Worchestershire sauce and garlic powder; mix to combine. Pour or spoon the sauce over the tops of the sandwiches. Cover the sandwiches with foil and let them sit for 10 minutes or so, then put them into the oven for 20-25 minutes. Take off the foil for the last 5 minutes of cooking. Hope these yummies make your football watching even more enjoyable! We love ham and cheese sandwiches. These would make a great dinner at our house, even though we don’t watch football. My son loves any kind of snack type lunch or dinner so I know these would be a hit with him.